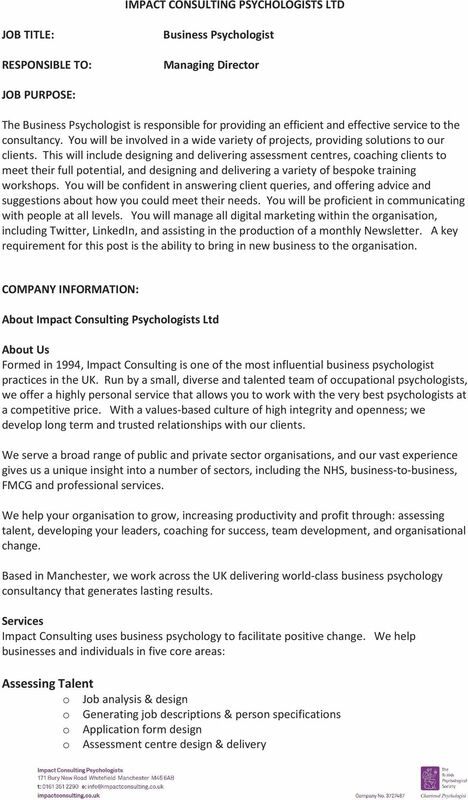 Download "ASSESSMENT BRIEF FOR POSITION OF BUSINESS PSYCHOLOGIST"
1 ASSESSMENT BRIEF FOR POSITION OF BUSINESS PSYCHOLOGIST We are pleased to invite you to apply for the position of Business Psychologist at Impact Consulting Psychologists Ltd. We have a strong commitment to attract and select candidates of the highest calibre. As part of this commitment, we have completed an analysis of the most important competencies required to be successful in this post. 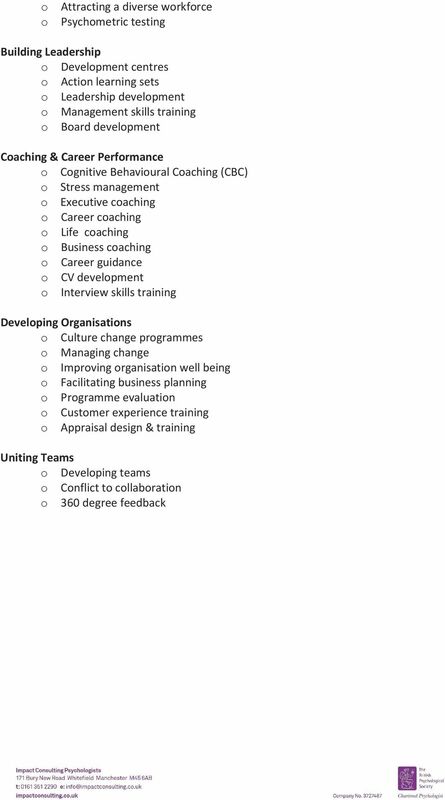 These key competencies are detailed in the job description and person specification. 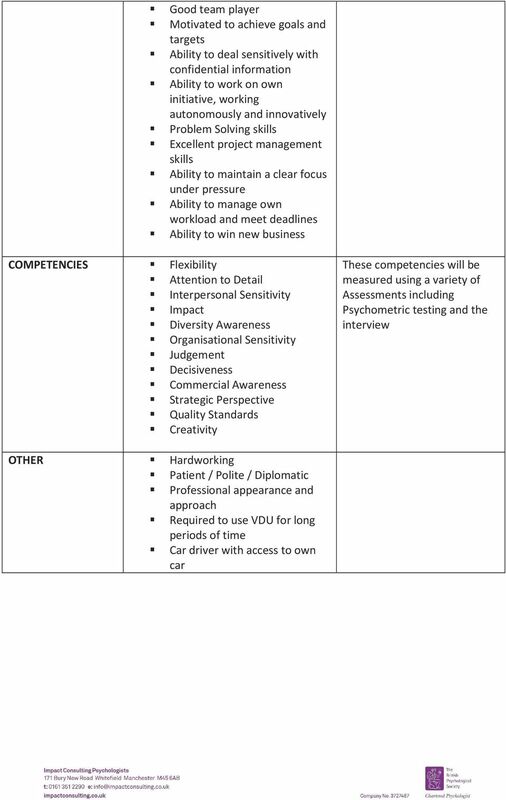 As we place a great deal of importance on this post, we are investing in a process that examines the required competencies in a range of ways. There will be 3 stages to the process; we will inform you after each stage whether you will be invited to take part in the next stage of the process. 1. Completion of application form 2. Assessment day where you will be required to complete a number of Psychometric tests 3. 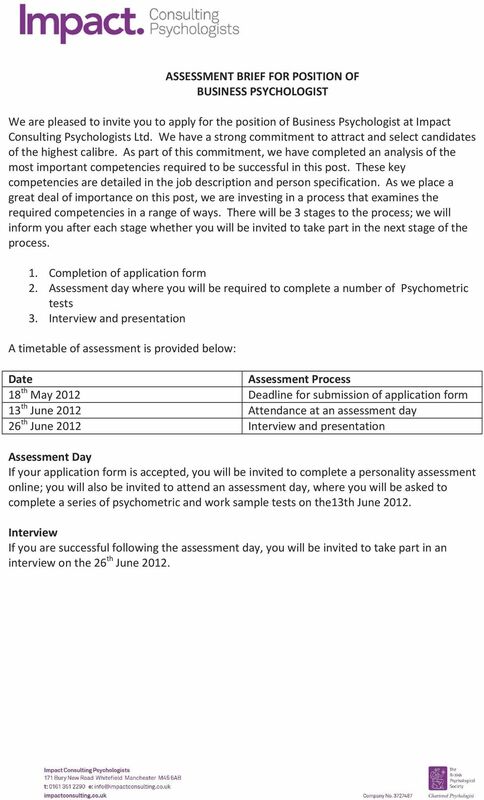 Interview and presentation A timetable of assessment is provided below: Date Assessment Process 18 th May 2012 Deadline for submission of application form 13 th June 2012 Attendance at an assessment day 26 th June 2012 Interview and presentation Assessment Day If your application form is accepted, you will be invited to complete a personality assessment online; you will also be invited to attend an assessment day, where you will be asked to complete a series of psychometric and work sample tests on the13th June Interview If you are successful following the assessment day, you will be invited to take part in an interview on the 26 th June 2012. 5 Planning and Organisation Tasks /Duties Update and manage office administration systems Be proactive in highlighting deadlines and chasing responses from clients On occasion, you may be required to fulfil administration duties Marketing and Business Development Responsible for Impact Consulting s twitter and linked in accounts, ensuring these are updated on a regular basis Manage the production of the monthly newsletter, including writing articles for this Confident and willing to make contact with potential clients and work to develop the client base and the business. 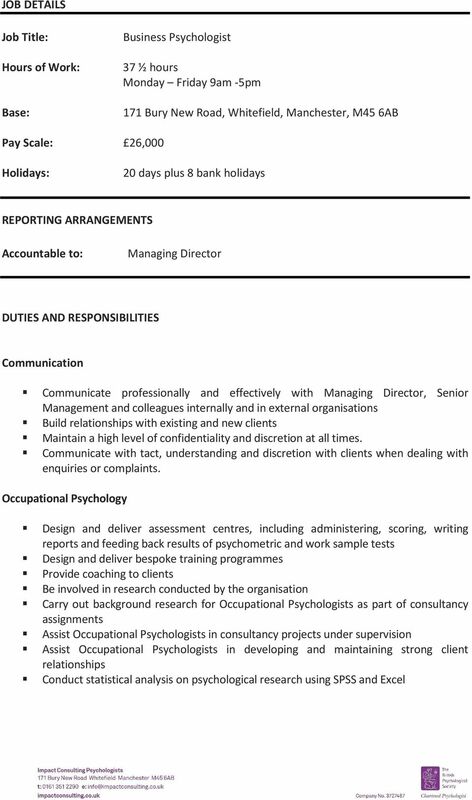 Assist Occupational Psychologists to identifying and pursuing opportunities for business development General Undergo a performance development review at three monthly intervals in the first year and thereafter six monthly. Undertake training as required. Undertake special duties/projects when required. Complete staff surveys as and when requested. Work within good practice outlined in the New Equality Act Follow Office Policies, may propose changes to working practices in office as part of the debate during monthly team meetings. Compliance with the Data Protection Act 1998 and Information Governance the post holder is not entitled to use for their own benefit or gain, or to divulge to any persons, firm or other organisation whatsoever, any confidential information belonging to Impact Consulting Psychologists Ltd or relating to the organisation s affairs or dealings which may come to their knowledge during employment. Compliance with the Health & Safety at Work Act 1974 the post holder is required to fulfil a proactive role towards the management of risk in all of their actions. This entails the risk assessment of all situations, the taking of appropriate actions and reporting of all incidents, near misses and hazards, and a statutory duty of care for their own personal safety and that of others who may be affected by their acts or omissions. Compliance with Office Policies and Procedures including the Code of Conduct. Responsibility for all records that they gather or use as part of their work within the organisation. The records may be paper or electronic The range of duties and responsibilities outlined above are indicative only and are intended to give a broad flavour of the range and type of duties that will be allocated. They are subject to modification in the light of changing service demands and the development requirements of the post holder. 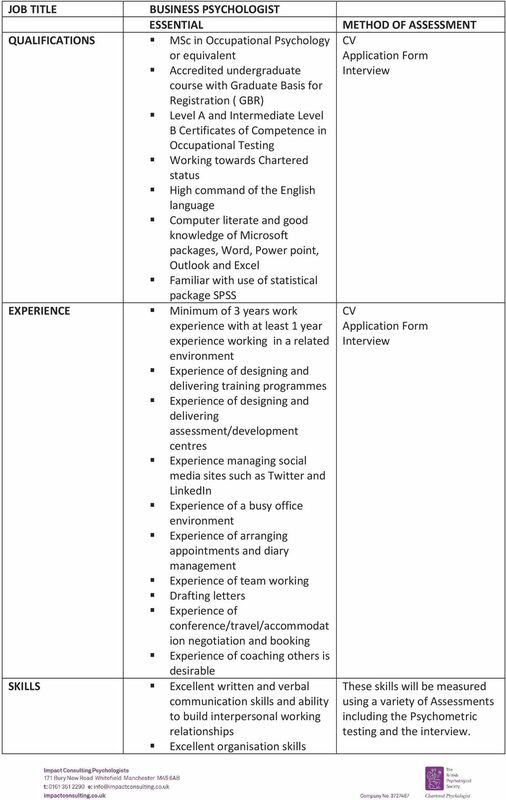 6 JOB TITLE BUSINESS PSYCHOLOGIST ESSENTIAL QUALIFICATIONS MSc in Occupational Psychology or equivalent Accredited undergraduate course with Graduate Basis for Registration ( GBR) Level A and Intermediate Level B Certificates of Competence in Occupational Testing Working towards Chartered status High command of the English language Computer literate and good knowledge of Microsoft packages, Word, Power point, Outlook and Excel Familiar with use of statistical package SPSS EXPERIENCE Minimum of 3 years work experience with at least 1 year experience working in a related environment Experience of designing and delivering training programmes Experience of designing and delivering assessment/development centres Experience managing social media sites such as Twitter and LinkedIn Experience of a busy office environment Experience of arranging appointments and diary management Experience of team working Drafting letters Experience of conference/travel/accommodat ion negotiation and booking Experience of coaching others is desirable SKILLS Excellent written and verbal communication skills and ability to build interpersonal working relationships Excellent organisation skills METHOD OF ASSESSMENT CV Application Form Interview CV Application Form Interview These skills will be measured using a variety of Assessments including the Psychometric testing and the interview.